Nitrogen is abundant in the environment as N2, but it is N bonded to oxygen, hydrogen, or C such as nitrate, ammonium, and organic N that comprises reactive N, and until recently this originated mainly by biological N fixation (Wet-zel 2001). As a consequence of the synthesis of nitrogenous fertilizers, burning of fossil fuels, and wide cultivation of crops such as soybeans that have N-fixing microbial symbionts, annual N fixation from anthropogenic sources now exceeds natural fixation (Vitousek et al. 1997). Nitrogen occurs in freshwater ecosystems in many chemical states (Table 11.1). Dissolved inorganic nitrogen (DIN) includes ammonium (NHj), nitrate (NOp, and nitrite (NO2). Dissolved organic nitrogen (DON) consists of amino nitrogen compounds (polypeptides, free amino compounds) and other organic molecules, and most particulate organic nitrogen (PON) occurs as bacteria and detritus. Total N includes all dissolved and particulate forms including both organic and inorganic. Nitrogen also occurs in gaseous forms as dinitrogen N2 and in association with oxygen as NOx . Inorganic N forms (ammonium, nitrate, and nitrite) are generally determined through colorimetric methods, although nitrate must be reduced to nitrite by passing the sample through a column filled with cadmium granules. Because standard methods of analysis do not distinguish nitrite from nitrate and the former is usually a minor fraction, they typically are combined and reported as nitrate. The determination of particulate and dissolved organic forms is more complex because it involves digestion of the sample after separation of dissolved forms from particulate forms by filtration. 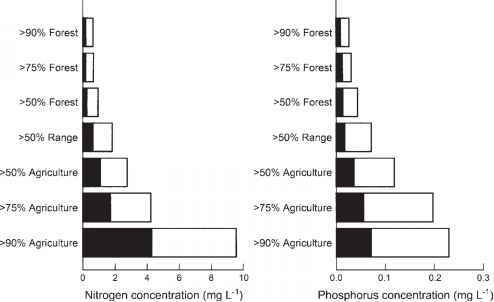 TABLE 11.1 Major forms of nitrogen and phosphorus found in natural waters (after Meybeck 1982). Nitrogen also is present as dissolved N2 gas (not shown). Total Phosphorus world average), and can be up to 90% in arctic and humic tropical rivers with high organic N content of soils and minimal anthropogenic DIN. Particulate N, including PON and ammonia, and organic N adsorbed to particles, may be important in some circumstances. Based on more than 1,000 stream sites in North America and New Zealand that included a wide range of human inf luence, the lowest one third of sites had < 0.7mg L 1 TN whereas the highest third exceeded 1.5mg L 1 (Dodds et al. 1998). Nitrogen concentrations are strongly influenced by land use in settled areas, and especially by agriculture (Figure 11.2). In undisturbed tropical rivers, present-day concentrations likely represent natural values, which for total N were reported to range between 0.27 and 1.05 mg L 1 (Lewis et al. 1999). Because nitrate concentrations were relatively low, varying from 0.09 to 0.19mgL \ TN must include a high fraction of DON in these pristine rivers. Lowest values occur in areas of high runoff, which also support the greatest amount of vegetation. as a source. 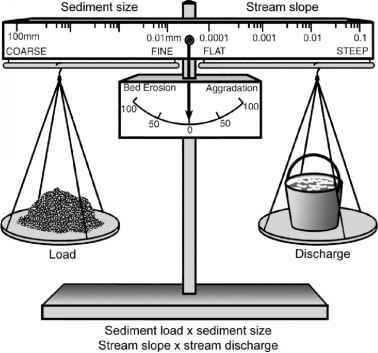 However, recent evidence indicates that some sedimentary rocks contain large amounts of fixed N, and so weathering may provide significant amounts of nitrate to running waters in some circumstances (Holloway et al. 1998, Thompson et al. 2001, Williard et al. 2005). Nitrogen inputs often vary seasonally due to the effects of the growing season and hydrology. Due to uptake of N by terrestrial vegetation, streamwater concentrations tend to be lower during the growing season and higher during the dormant season (Vitousek and Reiners 1975). Spatial variation in streamwater nitrate concentrations is influenced by nitrification in upland soils, which affects the extent to which catchments retain or export nitrate via stream-flow (Likens and Bormann 1995, Bernhardt et al. 2005a). In Sycamore Creek, a desert stream in Arizona where N is limiting to biological production, N fixation by the cyanobacteria Anabaena and Calothrix contributed up to 85% of the total N inputs to benthic communities. Fixation rates were highest during summer and autumn, and low during winter and spring due to seasonal differences in the abundance of cyanobacteria (Grimm and Petrone 1997). In a stream in the Pacific Northwest draining a N-rich riparian forest, a spring nitrate pulse was attributed to snowmelt flushing of nitrate that had accumulated in soils due to organic matter decomposition, and additional peaks were observed during rain storms (Bechtold et al. 2003). The relative contributions of groundwater versus surface and subsurface runoff can also contribute to temporal or spatial variation in nutrient supplies. In a Mojave desert stream, nitrate concentrations in groundwater inputs varied among three sources by more than tenfold (Jones 2002). In a Kansas stream, groundwater from agricultural fields increased nitrate concentrations during periods of low flow whereas concentrations decreased during periods of high flow, probably due to dilution from undisturbed upland reaches (Kemp and Dodds 2001). Principal anthropogenic inputs of N to streams include agricultural fertilizers, atmospheric deposition, N-fixing crops, and human and animal waste (Boyer et al. 2002). As a consequence of this enrichment, >10% of the rivers in the UK have nitrate-N concentrations as high as 9-25 mg L"1, more than three orders of magnitude above background concentrations (Heathwaite et al. 1996). So important is human influence that Caraco and Cole (1999) could explain over 80% of the 1,000-fold variation in nitrate export from 35 global rivers using a simple model based on fertilizer use, atmospheric deposition, and human sewage. Point sources from sewage were important in highly populated watersheds but nonetheless were smaller than inputs from fertilizer application and atmospheric deposition. The production of commercial fertilizers has increased greatly since 1950 (Schlesinger 1997), which undoubtedly accounts for significant increases in nitrate concentrations in rivers. Although some fertilizer is assimilated by crops, when applied at high levels, substantial amounts of N leach into surface and groundwater, resulting in increases in river nitrate concentrations (Heathwaite et al. 1996, Gachter et al. 2004). The cultivation of crops that harbor N-fixing bacteria also increases the amount of reactive N in soils, representing as much as half of the inputs due to fertilizer application (Vitousek et al. 1997). 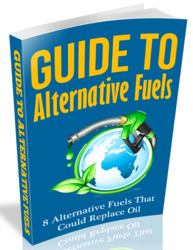 Increased atmospheric deposition of N is primarily the consequence of the burning of fossil fuels to generate electricity and in automobiles. Prein-dustrial N deposition likely was higher in the tropics than in the temperate zone because natural volatilization processes that release N oxides into the atmosphere, including biomass burning and soil emissions, are greater in tropical regions.